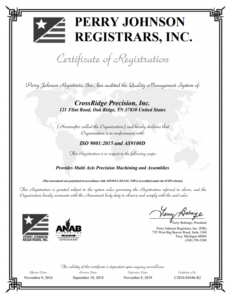 CrossRidge Precision, Inc. (CPI), founded in 1962, is primarily a contract precision manufacturing facility. The company specializes in precision machining of aluminum, titanium, stainless steel, steel bar stock, castings, and forging of these materials. Tolerances held on aerospace parts are +/- .0001” in diameter and length, True Position of .001” and lapping flat to .00004”. Also, able to hold .0002” tolerance through machining and grinding after anodize processing and hard coat anodize processing, +/- .0001” tolerance for carburized and hardened parts, and .0001” tolerance for tool steel parts through hardening and finish grinding. CPI is able to hold tolerances to .00005” cylindricity of spools and bores on hydraulic components. The company produces over 1,000,000 automotive components per year. Special processes such as heat treating and plating are performed by NADCAP approved vendors.